This simple salad is popular in French Bistros. The wonderful flavors of a weekend breakfast make this salad a comforting treat. Whisk the chopped onion, vinegar and mustard in a small bowl. gradually add the oil in a steady stream to make a thick dressing, set aside. Wash and spin dry the lettuce. Coat a large frying pan with cooking spray. Fry pancetta (or bacon) along with the crushed garlic clove. Cook until pancetta is crisp, about 6-8 minutes. Remove with slotted spoon, set aside. Reduce heat, cook bread cubes in the drippings and garlic. Cook until crisp, stirring frequently for about 5 minutes. Bring a large pot of water to a gentle boil. Crack the eggs one at a time into a measuring cup. Gently lower the eggs one at a time into the water and poach for 3 mins exactly. Remove the eggs with a slotted spoon when done. 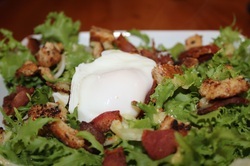 Arrange lettuce on four plates, top with onion slices, pancetta, and croutons. Toss with 1/4 of dressing. Top each salad with a poached egg.